Fits on your turntable, CDJ, mixer, or laptop for convenient hot cue, loop roll, and auto loop control. Serato Scratch Live has a new partner: The Novation Dicer. Developed with Serato, this palm-sized cue point and looping controller has been designed to fit exactly where you need it: on your turntables, CDJs, mixer, or laptop. Dicer always ships in pairs-one for each side. Plug Dicer in, slot it on your turntable/CDJ, and you can instantly set cue points and use them to trigger Hot Cues. Or, flip Dicer into Auto Loop or Loop Roll modes to trigger loops, or roll sections of the track to create climaxes, drops, and glitchy breaks. Each mode illuminates Dicer's pads a different color, so you can instantly see what mode the pad is in, which is extremely advantageous in the usual dark clubs and venues. The forthcoming Scratch Live 2.1 update will automatically map the Dicer to these functions and provide full LED feedback-red for Hot Cues, green for Loop Roll, and amber for Auto-Loop. Dicer can control all cue-point and looping functions in the current version of Serato Scratch Live 2.0. This requires you to simply learn cue-point and looping to Dicer's pads, using Scratch Live's MIDI-learn function. The public beta of Scratch Live 2.1 is available now. Dicer's buttons can also learn other software functions. You can assign different FX to the pads, trigger samples over the top of your mix, or even browse tracks in your iTunes library. Dicer was designed by Novation in collaboration with Ean Golden-DJ and curator of DJ Tech Tools. 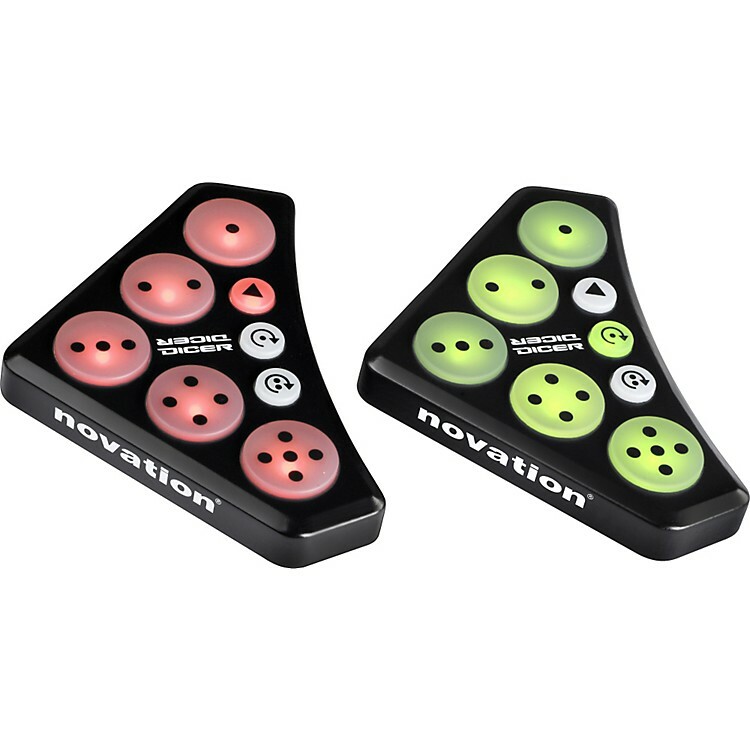 Ean came up with the concept of a controller that fits on the turntable, and his contribution has been crucial in helping Novation design and develop Dicer. W & D = 90mm/3.5"; H = 13mm/0.5"